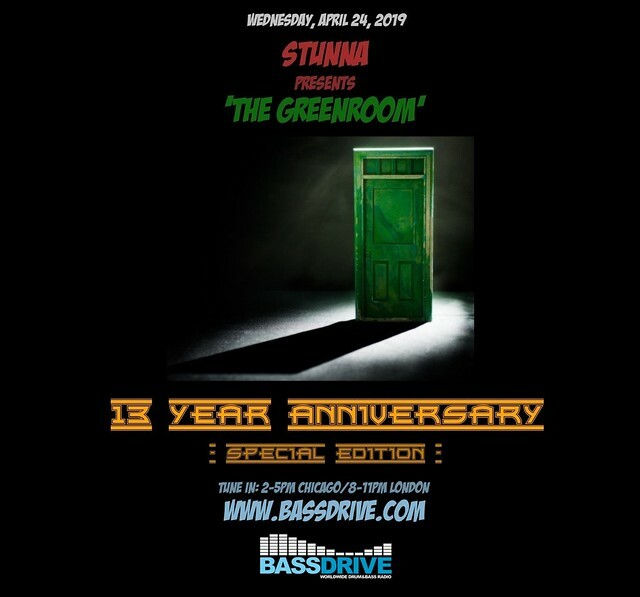 On WEDNESDAY, APRIL 24, 2019, STUNNA presents the 13-YEAR Anniversary Special edition of 'THE GREENROOM' on BASSDRIVE radio. After nearly 700 three-hour installments of the program, countless in-studio guests and guest mix performers showcased on the show, I wish to extend a massive 'THANK YOU' to all the producers, labels, and listeners alike who keep things fresh each session. Join us as we celebrate the cutting edge sounds created week in/week out courtesy of talented artists from around the globe. 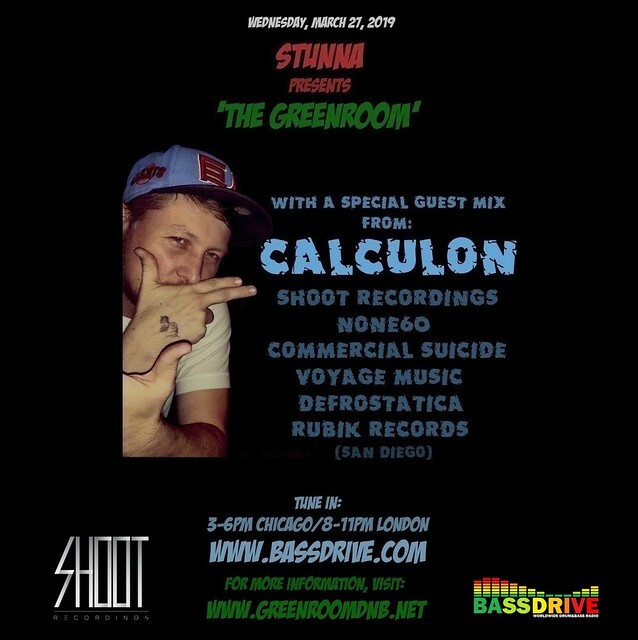 Tune in!! 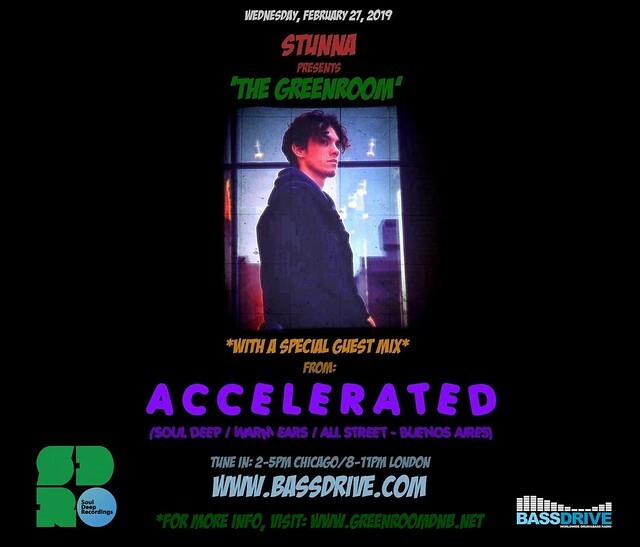 On WEDNESDAY, MARCH 20th, STUNNA unveils an exclusive installment of 'THE GREENROOM' BASSDRIVE radio. In this week's broadcast, we're treated to not one, but two special guest mixes created specifically for the program. AARON JAY and J SKEPTIK, the minds behind revered DRUM+BASS imprint INFLUENCE RECORDS, make their 'GREENROOM' debut, as each drops exclusive sets in support of their label. Beginning his journey as a DJ in 1997, UK-based AARON JAY quickly earned his stripes as a resident at FABIO's legendary 'SWERVE' night in LONDON in 2002. Performing monthly to dub-hungry punters who like their rhythms both soulful and funky, AARON's arsenal of unsigned tracks soon led him to create his very own label. Founded in 2008, the INFLUENCE RECORDS imprint has pushed the deeper side of DRUM+BASS with a stellar roster of talent including: ATOM, BAL, BROTHER, DATA, DAVE OWEN, DELTA + FORMAT, EASY + GEEKS, EVESON, FLACO, FURNEY, ICR, KJELL, MIXMASTER DOC, MR JOSEPH, RANDOM MOVEMENT, RAW Q, SINISTARR, SOUL INTENT, and SPECIFIC. AARON has also found time to team up in the studio domain with the mighty LYNX (CREATIVE SOURCE, DETAIL, SOULr). Having previously released music on 31 RECORDS, the pair also has forthcoming material on INFLUENCE in the near future. The year 2015 saw the addition of fellow UK countryman J SKEPTIK to the INFLUENCE RECORDS family as label manager. Beginning his musical path with DRUM+BASS by listening to old tap packs included DREAMSCAPE, HELTER SKELTER, ROAST, and TELEPATHY, then 17-year-old J SKEPTIK got his first set of vinyl decks in 1999 and hasn't looked back since. Having played many cities throughout the UK for brands including HOSPITALITY, ON A MISSION, PARADOX, RIDDM, SOCIAL:BEATZ, and SOUNDCLASH (to name a few), in 2016, J SKEPTIK got his first international booking in AMSTERDAM for the popular CHEEKY MONDAY brand. 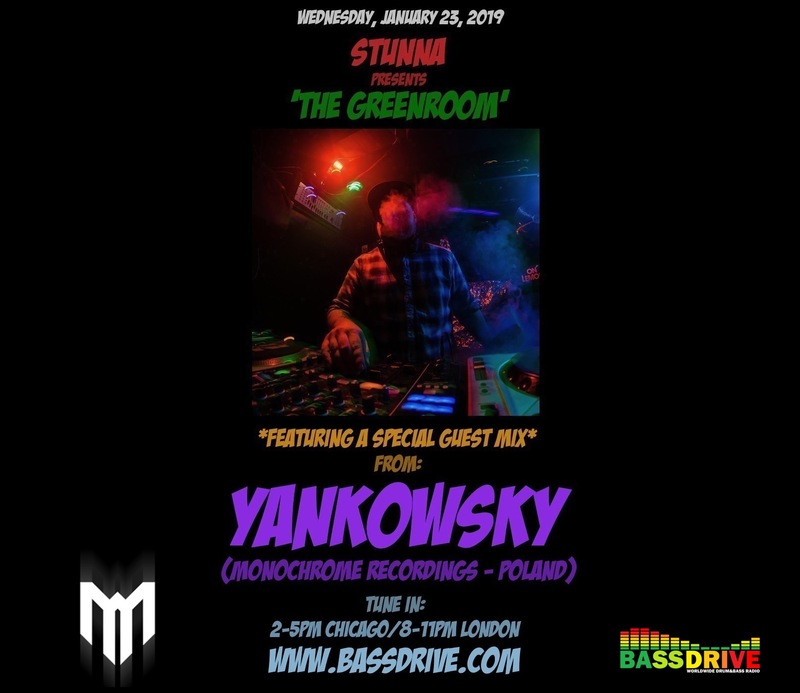 Playing a broad stroke across the full spectrum of DRUM+BASS music, J SKEPTIK has always had a passion for the more LIQUID, deeper vibes that this music brings. In 2019, INFLUENCE RECORDS continues to push forward with the deeper D+B spectrum and has releases set to drop from the likes of EASY + GEEKS and SERGIO MANIFESTO. With nearly a dozen years in the label game, AARON JAY will also be putting together an exclusive remix project featuring some very exciting names on board. JULY 27, 2019 marks the first INFLUENCE RECORDS night in LONDON. Aptly named 'INFLUENCED,' the night (and following series) will focus on bringing together some of the best artists in the scene that are currently pushing the deeper, refined sound for which the label has become known. The opening event will feature FABIO, MAKOTO, AARON JAY, SMJ, and J SKEPTIK. 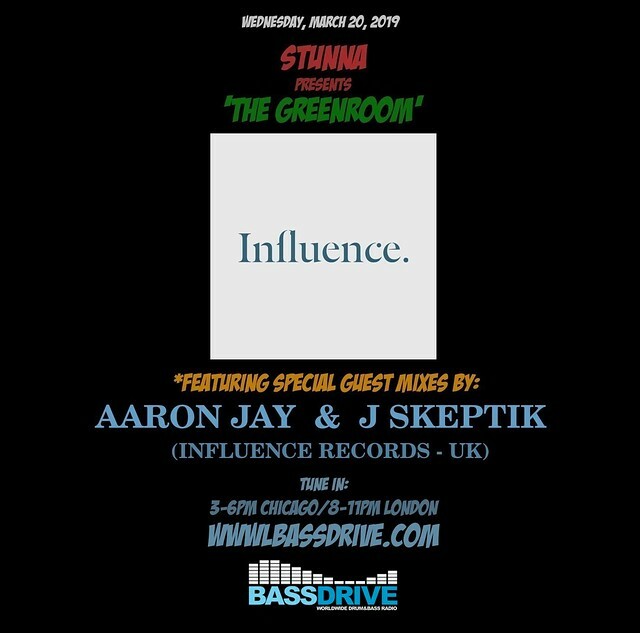 Join us this broadcast as AARON JAY and J SKEPTIK both present guest mixes featuring new and exclusive sounds from the INFLUENCE RECORDS stable, as well as some of their favorite tracks doing the global rounds. Tune in! 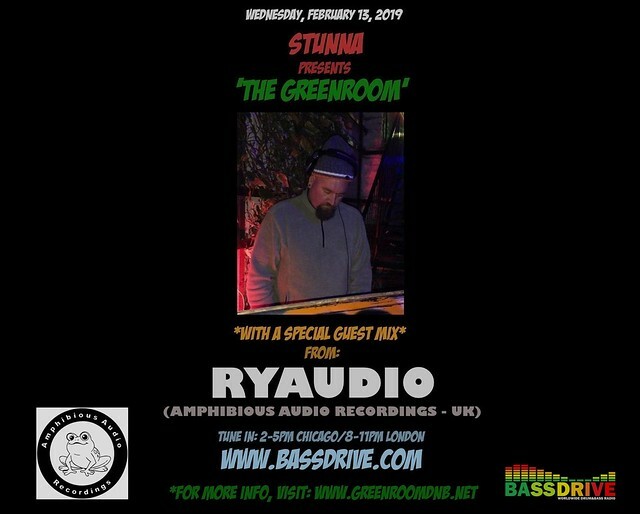 On WEDNESDAY, MARCH 13th, STUNNA presents another special edition of 'THE GREENROOM' BASSDRIVE radio. In this week's installment, we're treated to an exclusive guest mix from talented producer and DJ MAGNAFIDE, as he makes his debut on the program. LOS ANGELES, CALIFORNIA-based artist MAGNAFIDE (CRIS CISNEROS) began learning about music composition and audio production in 1999. Upon hearing HIGH CONTRAST's seminal "TRUE COLOURS" album in 2002, he became deeply dedicated to his craft and has been producing mainly LIQUID FUNK DRUM+BASS music ever since. He's written for labels such as PEER PRESSURE, SOUL DEEP, STEPPING FORWARD, and TRUST AUDIO. His work has been featured on BBC Radio 1 by FABIO and has garnered global support from scene stalwart LTJ BUKEM. A huge fan of collaborating with other like-minded producers, MAGNAFIDE has teamed up and penned releases with the likes of COSMOLOGY, DUBSKY, GABRIEL HABIT, and ZERE. Founding member of L.A.'s FOURTH LEVEL COLLECTIVE, he also has a side D+B project with LIVING PROOF and TEAL, under the 'HOLISTIX' moniker. APRIL 1, 2019 will see the release of his brand new 'HYDROTHERAPY' EP for the prestigious SOUL DEEP RECORDINGS imprint. 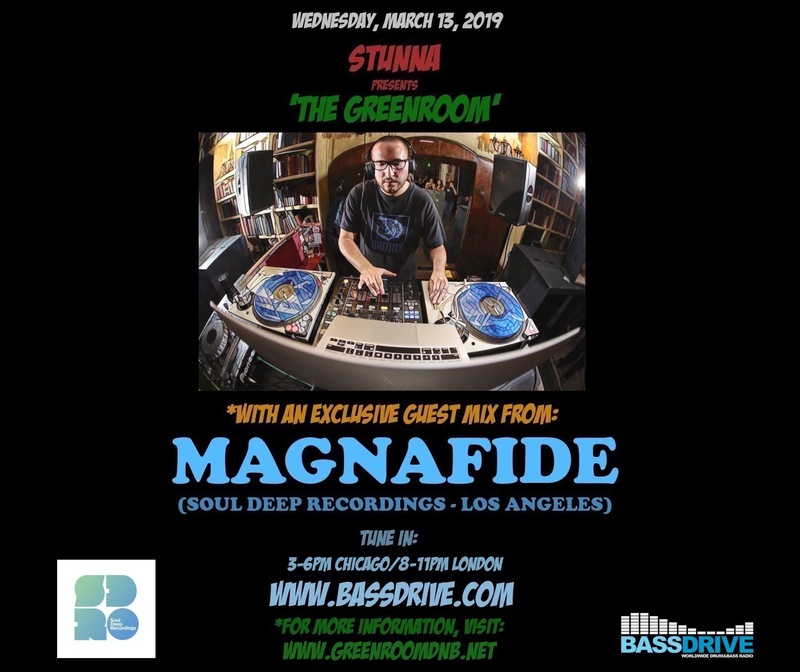 Showcasing his prowess and acumen in the studio domain, the four track EP highlights MAGNAFIDE's diversity as a producer who combines beautiful, melodic hooks with sturdy, bass-laden beats aimed directly at the dance floor. 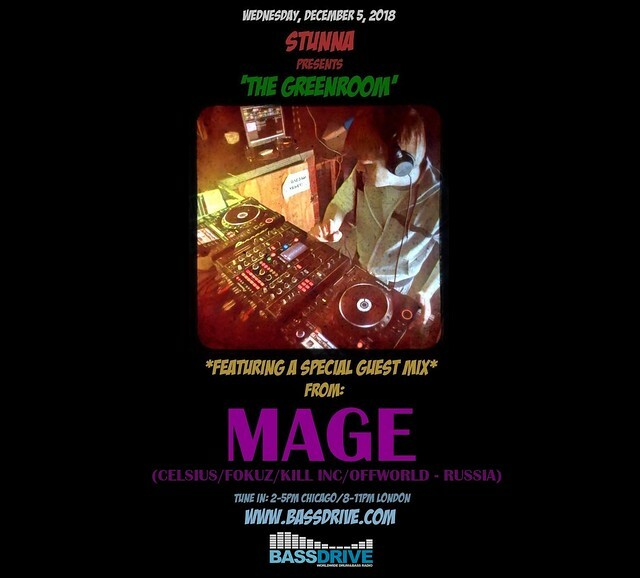 Join us this session as MAGNAFIDE dives deep into his bag for his favorite tracks doing the worldwide rounds and presents his inaugural guest mix for 'THE GREENROOM.' Tune in! On WEDNESDAY, MARCH 6th, STUNNA kicks off a new month of broadcasts in 'THE GREENROOM' on BASSDRIVE radio with a special feature mix on the brand new album from one of DRUM+BASS music's finest talents on the global scene. 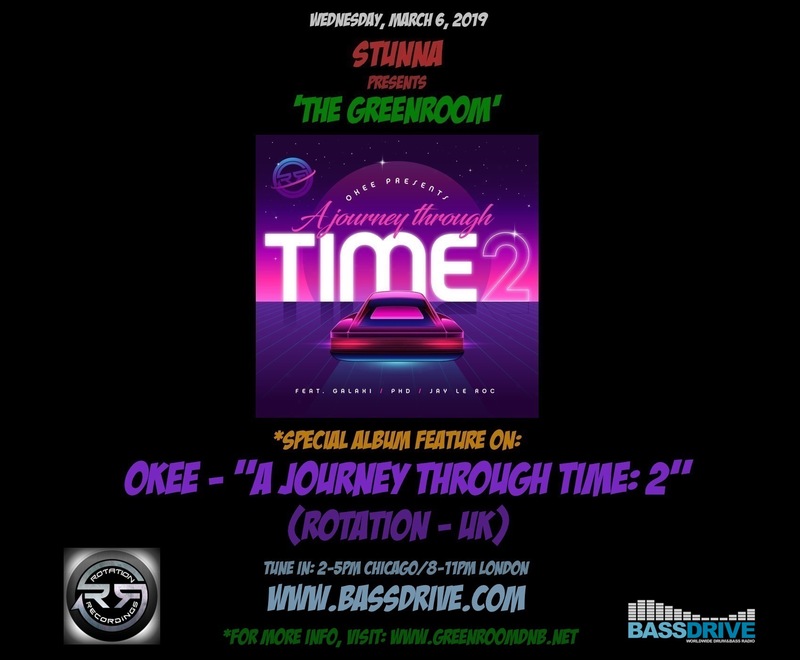 Versatile producer OKEE's "A JOURNEY THROUGH TIME: 2" LP has recently landed courtesy of the ROTATION UK imprint and STUNNA presents an exclusive mix featuring some of the album's finest moments. SERBIAN-based artist OKEE (SLOBODAN OLJAčA) has drawn his musical inspirations from deep space exploration and futuristic soundscapes. 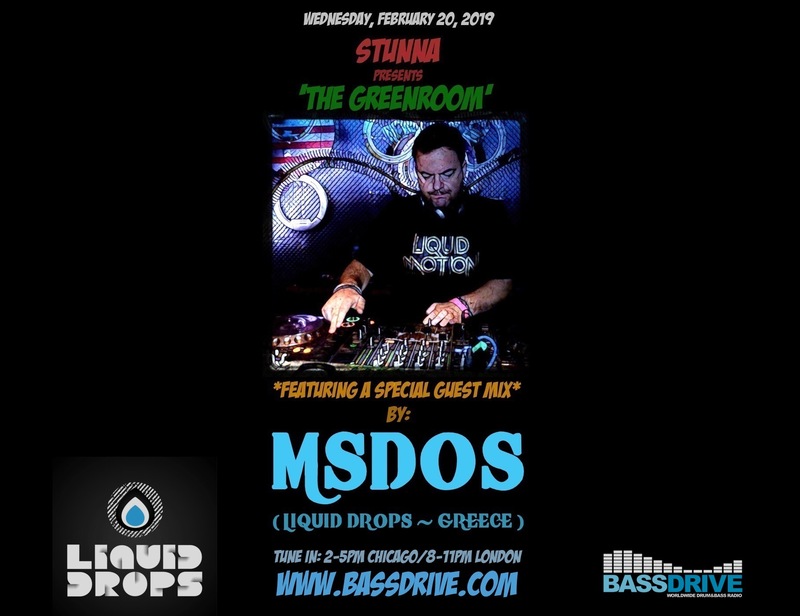 A long-time supporter and key figure within the modern ATMOSPHERIC DRUM+BASS movement, his impeccable productions have gained worldwide support from revered labels such as OMNI MUSIC, SOUL DEEP, KOS.MOS, EXILED, ADVECTION, SKELETON, SMOOTH N GROOVE, TEMPO, LIQUID DROPS, REPERTOIRE, MIDNIGHT SUN, among many more. 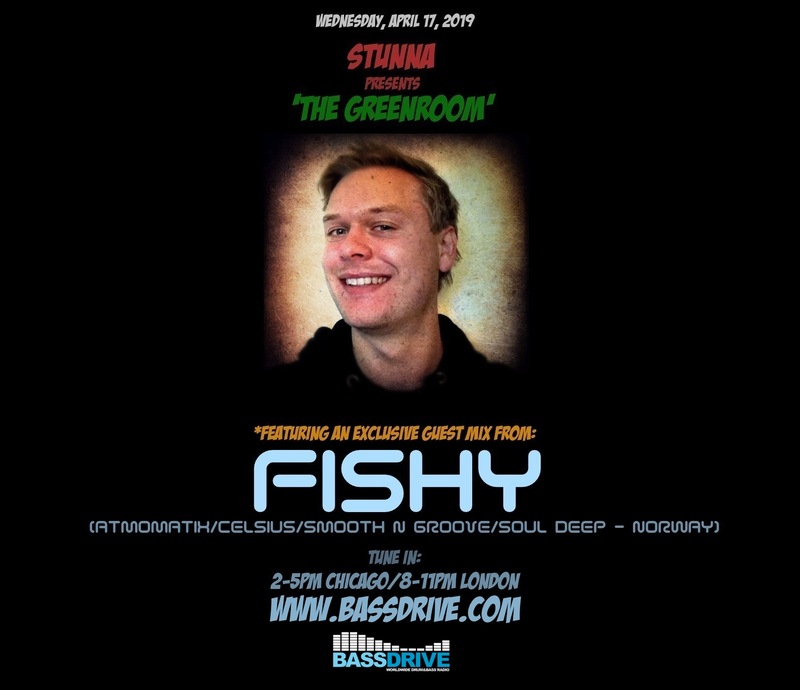 His "A JOURNEY THROUGH TIME" EP on ROTATION UK was released in 2012 and showcases a true love of producing new music with a sentimental nod to the past. MARCH 2019 sees the follow-up to this statement, in form of the "A JOURNEY THROUGH TIME: 2" LP, and it's truly a special affair. Dedicated to the late, great JAY LE ROC (JASON BROWN, one of the godfathers of ATMOSPHERIC DRUM+BASS), "A JOURNEY THROUGH TIME: 2" also features collaborations and remixes from scene stalwarts PHD, GALAXI, and LM1. Join us this session as STUNNA presents a special feature mix and showcases the talented OKEE's "A JOURNEY THROUGH TIME: 2" LP on ROTATION UK, one of the leading lights in the ATMOSPHERIC DRUM+BASS movement. Tune in! 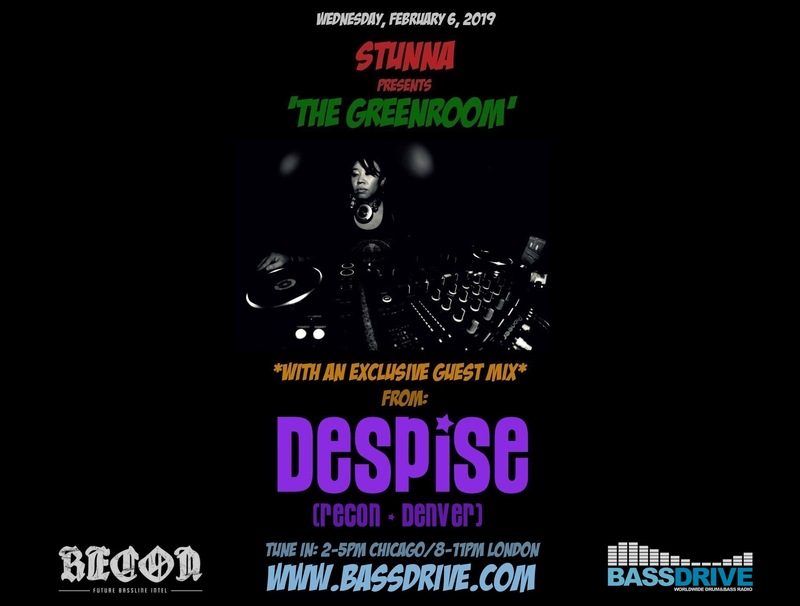 On WEDNESDAY, FEBRUARY 27th, STUNNA closes out another month in 'THE GREENROOM' BASSDRIVE radio with an installment featuring one of DRUM+BASS music's new talents on the rise. In this session, we're treated to an exclusive guest mix from ACCELERATED. Hailing from MAR DEL PLATA, BUENOS AIRES, ACCELERATED (aka FERNANDO MARTIN ESTECHE) is a 23 years old LIQUID FUNK producer that began producing in 2017. On his debut 'LOSSLESS LOVE' EP release on SOUL DEEP RECORDINGS, ACCELERATED flexes his burgeoning production skills and expertly balances atmospheric vibes with emotional textures and voices. His sophomore EP release showcases his versatility, combining deep and dark flavors with "ELEVATED" and his remix of "THE LAST TIME." Influenced by talented artists such as SATL, MALAKY, SILENCE GROOVE, PHIL TANGENT, GLXY, R1C0, ILL TRUTH, and CHANGING FACES, ACCELERATED has continued to progress as a producer and is currently working on brand new material. With forthcoming releases slated soon on ALL STREET RECORDINGS and WARM EARS MUSIC, be on the lookout for plenty more quality sounds from ACCELERATED throughout 2019 and beyond. 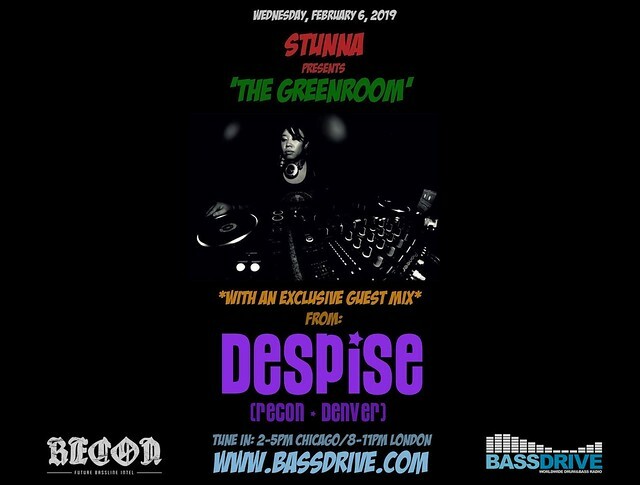 Join us this session as ACCELERATED presents a guest set created especially for this broadcast. Tune in! 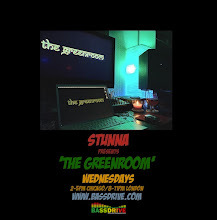 On WEDNESDAY, JANUARY 2, 2019, STUNNA kicks off a brand new calendar year of 'THE GREENROOM' on BASSDRIVE Radio. 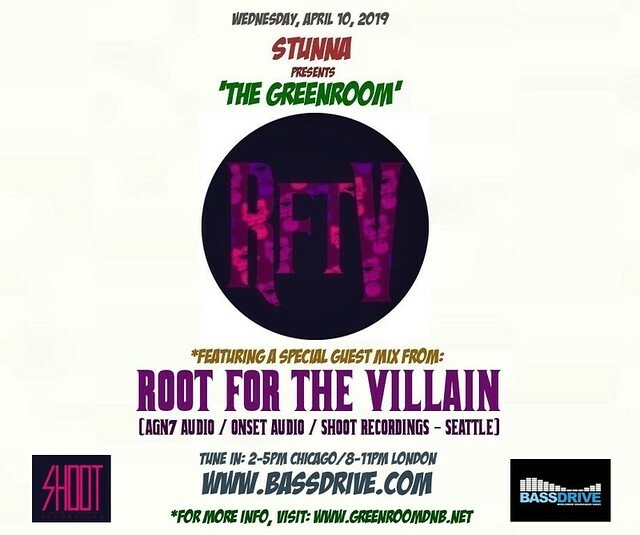 In this installment, we're treated to a special guest mix from producer and DJ on the rise KOLA NUT, as he makes his 'GREENROOM' debut. UK-based artist KOLA NUT (aka GREG PARKINSON) has been an active DJ for nearly two decades, specializing in DRUM+BASS and occasionally turning his hand to UK GARAGE, HIP HOP, REGGAE, HOUSE and DISCO music. Throwing his hat into the production ring recently alongside REPERTOIRE's seasoned head honcho LAW, the pair had their first release as a team on the SILENT FORCE imprint in SEPTEMBER 2018, quickly followed in OCTOBER with their sophomore release on sister label SONIC FORCE. 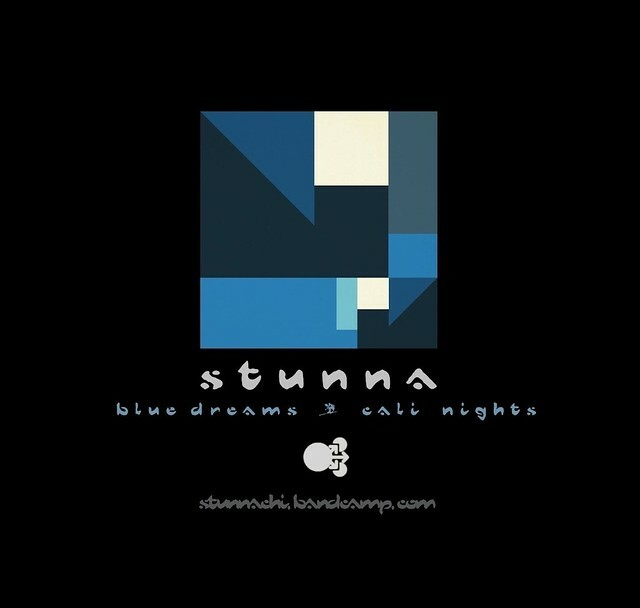 STRICTLY NU-SKOOL Blog described their work as: "LAW and KOLA NUT nail that iconic atmospheric JUNGLE sound as championed by labels such as LUCKY SPIN, GOOD LOOKING and STREET BEATS, circa 1994-1995, whilst injecting a touch of 2018 production skills into the formulae." The pair have big plans for 2019 including new tracks on 7TH STOREY PROJECTS, REPERTOIRE, and SILENT FORCE. 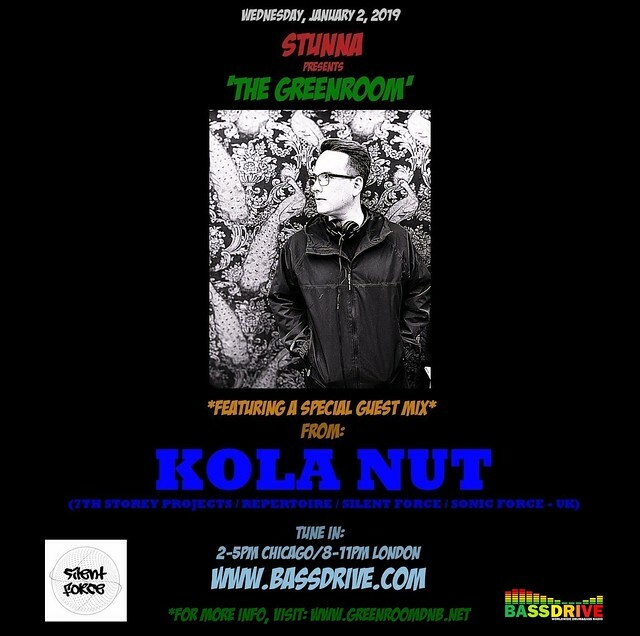 Join us as we kick off 2019 in fine fashion with a special guest mix from KOLA NUT as he expertly weaves his own productions and intertwines them with classic sounds from JUNGLE's past. Tune in!! That time of year has once again reared its head, and on WEDNESDAY, DECEMBER 26th, STUNNA presents the annual 'Year In Review/Year Ahead Preview' installment of 'THE GREENROOM' on BASSDRIVE Radio. In this edition, we take a look back at the action-packed year of 2018, highlight some great moments in DRUM+BASS music's many forms, and also take a sneak peek at what the future holds in 2019 and beyond. 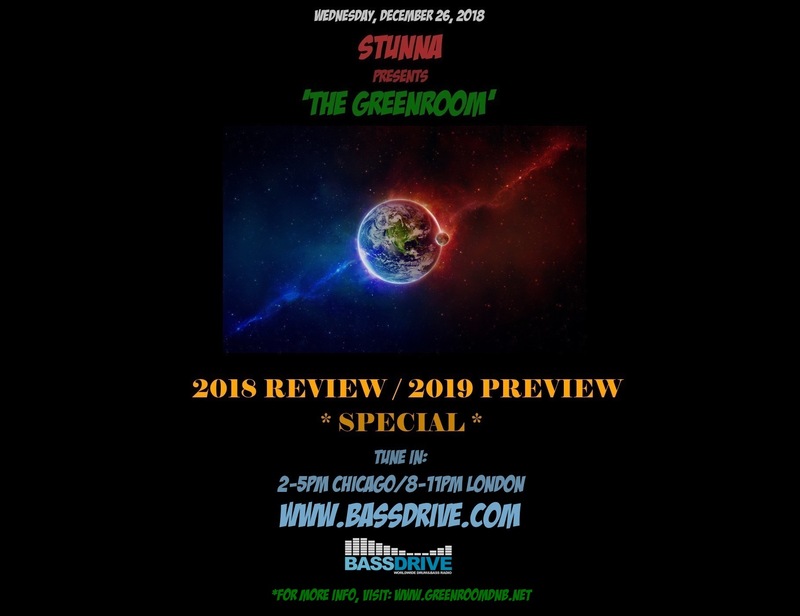 On WEDNESDAY, DECEMBER 19, 2018, STUNNA presents another special installment of 'THE GREENROOM' on BASSDRIVE Radio. In this broadcast, we're treated to an exclusive guest mix from producer and DJ on the rise CHUG, as he makes his 'GREENROOM' debut. 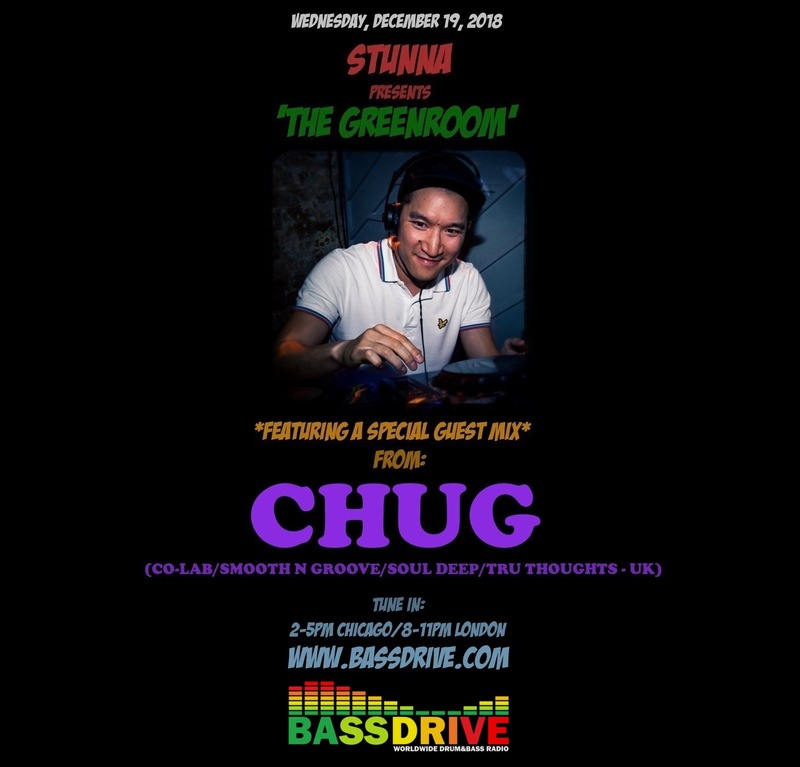 Beginning his musical journey as a DJ two decades ago in NORWICH, UK, CHUG (aka ROB CHUNG) was initially inspired by TIM WESTWOOD’s infamous BBC RADIO 1 Rap show, and immersed himself buying U.S. Hip-Hop. However, after the launch of local pirate station Flight 100 FM, he was exposed to the sounds of UK GARAGE and DRUM+BASS. As a punter, his first memorable raves were URBAN TAKEOVER with MICKEY FINN and APHRODITE, and the MOVING SHADOW tour with EZ ROLLERS and DOM AND ROLAND, both at the UEA LCR. 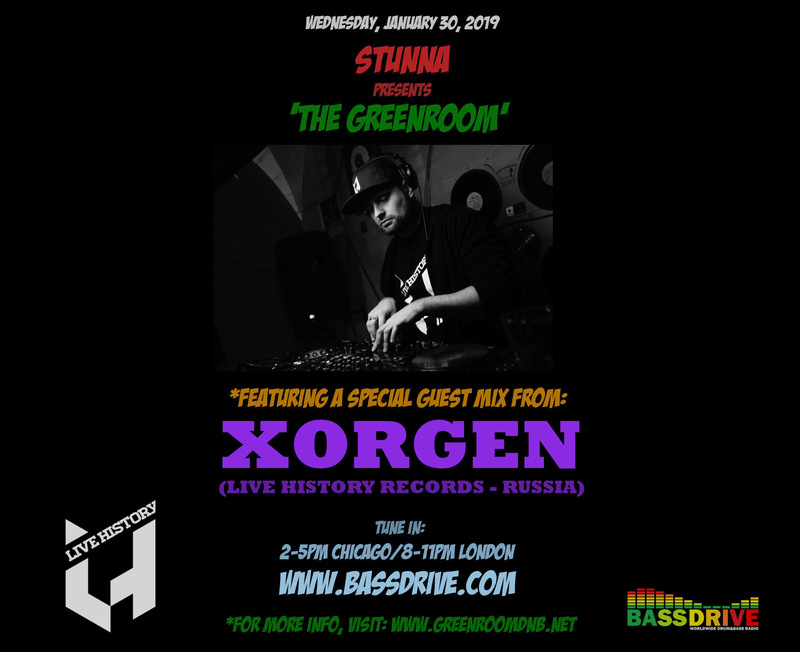 Whilst at school, he got his first gig on the Sunday UK GARAGE scene, after which he moved to LONDON and started playing on the university circuit and beyond. CHUG has performed at venues such as THE EGG, SE1, GRAMOPHONE, MINISTRY OF SOUND, CLUB AQUARIUM, 93 FEET EAST, RHYTHM FACTORY and THE MARKETPLACE. Playing for promoters such as THE VINYL TOUCH, STUN LONDON, and TRAFFIC, CHUG has graced the decks on lineups with artists such as ADAM F, ANDY C, AQUASKY, ARTFUL DODGER, A-SIDES, BREAKAGE, BRYAN G, COMMIX, DEVIOUS D, DIGITAL, DJ DIE, DJ HYPE, DR S GACHET, ELLIS DEE, EZ ROLLERS, INFLUX UK, J MAJIK, NERO, NICKY BLACKMARKET, RAY KEITH, SCRATCH PERVERTS, SHUT UP AND DANCE, STORM, TEEBEE, BASSLINE, DET, DYNAMITE MC, ESKMAN, LOWQUI, MESSY MC, NAVIGATOR, and SHABBA D. He currently co-promotes a club night, "ELEMENTS," in east LONDON, playing the full spectrum of DRUM+BASS music. Influenced by the SOUL, FUNK, and JAZZ samples that defined the BOOM BAP sound, CHUG started dabbling in D+B production in 2010. In 2017, he got his first release on SCOTT ALLEN’s L.A.-based SOUL DEEP RECRODINGS imprint. 2018 has seen two remixes released on the acclaimed label TRU-THOUGHTS, releases on HEIST’s CO-LAB RECORDINGS, and WASHINGTON, D.C./NORTHAMPTON, UK label SMOOTH N GROOVE RECORDS imprint. His debut EP, entitled 'HOLDING ON' recently dropped this month on SMOOTH N GROOVE and has thus far received early critical acclaim. Looking ahead to 2019, CHUG has more releases scheduled with CO-LAB and their sister labels PURE-VIBES and the LIQUID-LAB. Join us this session as CHUG graces 'THE GREENROOM' with a special guest mix featuring his own productions alongside some of his favorite tracks from around the globe. Tune in! !